XL-Connector has a very powerful tool allowing you to pull ANY data from your Force.com database into Excel. To pull data from a Force.com database to Excel using a SOQL query, click the Get Data button in your XL-Connector ribbon. One important thing to remember when using XL-Connector Get Data dialog is that it will run any text entered in the big text box as a SOQL query against the Salesforce database you’re currently logged in to. Essentially, you don’t need to use the rest of the controls in this dialog box at all, as long as you can craft a syntactically correct SOQL query. If you’re experiencing any troubles with SOQL, please refer to Salesforce’s documentation. All other controls in the Get Data dialog are there to help you build a correct query providing you a view into your Force.com schema and making sure you’re using the correct object names, field names, and pick list values. These controls are called ‘query builder controls’. If the ‘Auto-generate query’ box is checked — any change to the query builder controls will rebuild the query in the query box. Please be careful with this setting if you are building a more complicated query that requires manual entry, it is always a good idea to uncheck that box and use the ‘Refresh query’ button (green circular arrows) if you really need to refresh the query based on the query builder selections. The Get Data dialog lets you save your queries locally in theXL-Connector settings and later retrieve and reuse them. The saved queries will only be available to you on the same computer, if you need to take a query to a different computer, just copy-paste it to any text editor and save to a file. As we mentioned at the beginning of this article, you can use any SOQL query to pull data from Salesforce.com to your Excel spreadsheet. When your ‘Auto-refresh query’ box is unchecked, you can still use the object and fields selection drop downs, and then add the whole or a part of the query generated by them to the existing query that you are building without overwriting it. By default, data pulled from your Salesforce.com database will start at column 1 row 1 of your spreadsheet. But you can put it elsewhere if you wish. Just enter the desired address of the data’s leftmost upper cell in the ‘First cell address’ field, or click the button next to it and choose the cell directly from your spreadsheet. If you are pulling values from columns of ‘Pick list’ type in Salesforce, you have an option to create drop-down lists right inside of Excel in each row of the data for such columns. To enable this feature, you will need to check the ‘Enforce pick list values’ box in the Get Data dialog before running the query. Additionally, all your pick list dependencies are observed if both dependent and controlling pick lists are pulled into the spreadsheet. Any field of the User, Profile, and UserRole objects can be used in these queries. 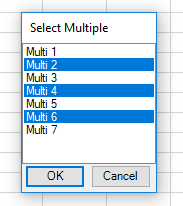 Please note that you can’t use Date, DateTime, Boolean, or Number fields when using a dynamic range of values since all values in the range will be enclosed in quotes.